Recently I wrote an article highlighting 5 ways to try Linux without messing up windows (http://www.everydaylinuxuser.com/2012/09/5-ways-to-try-linux-without-messing-up.html). 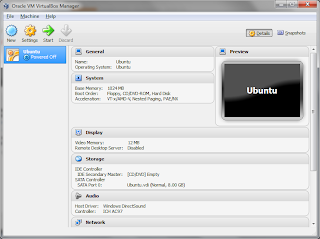 In the article I highlighted that you can use the WUBI installer to install Ubuntu within Windows. One of the comments at the bottom of the article asked “What about virtual machines?”. 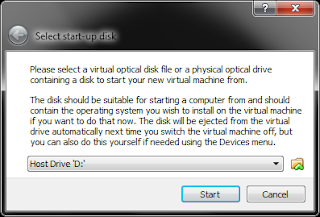 This article shows how to do both within Windows 7. 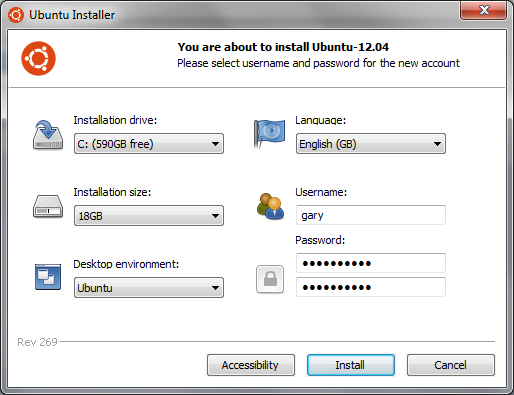 Go to this link http://www.ubuntu.com/download/desktop/windows-installer. Run the downloaded file and the following screen will appear. 5. Choose a user and password to run under. When you have entered all the details click install. 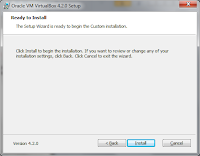 The installer will process the installation and download the files needed from the Ubuntu server and then you will be asked to reboot your machine. When you reboot, Ubuntu will finish installing and you will be given the choice whether to boot into Ubuntu or boot into Windows. Every time you boot the computer from this point on you will be need to choose whether to use Windows or Ubuntu. The files for the Ubuntu install can be found in c:wubi (or whichever drive letter you chose to install WUBI under). You should not mess around with these files directly. Either boot into Ubuntu to use Ubuntu or boot into Windows to use Windows. 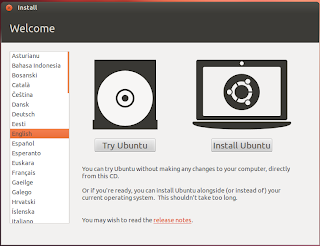 If you do not want to use Ubuntu anymore simply run the Ubuntu Uninstall program within Windows. 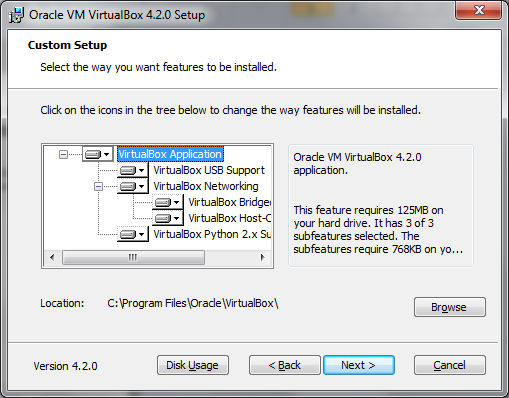 Virtual Box provides the same functionality as Virtual PC and is free to download from https://www.virtualbox.org/wiki/Downloads. 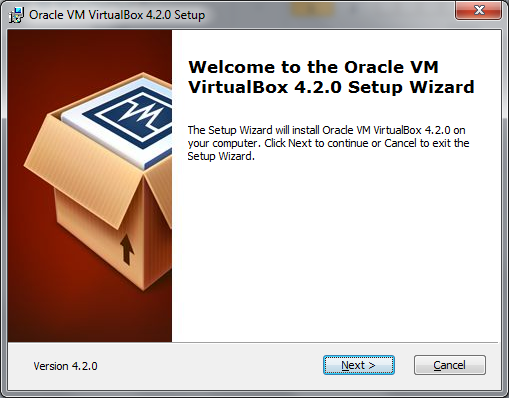 Virtual Box is provided by Oracle so it is a fairly trustworthy source. Virtual Box basically gives you the ability to run virtual computers or a machine within a machine. 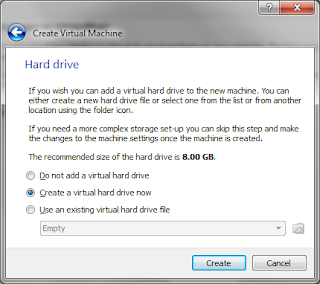 You simply create a virtual machine, specify a virtual hard drive (which is basically a file on your hard drive) and then you can install any operating system you choose. Run the installer by double clicking on the executable file that you downloaded. The first screen is just a welcome screen. 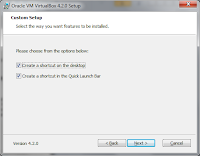 Clicking next takes you to a screen where you can choose which parts of VirtualBox you wish to install. Unless you are limited by space I would recommend accepting the default options and choosing next. The third screen asks where you want the icons for Virtual Box to go. You can choose to have an icon on the desktop and/or on the quick launch bar. The 4th screen looks a bit alarming because of the red writing but you can generally just click yes. What this screen is saying is that you may temporarily be disconnected from the internet. Finally you are ready to install. Click Next. Half way through the installation you may see some messages about device drivers that need to be installed. I recommend clicking the checkbox that says that you are happy to accept all drivers from Oracle. That is it. VirtualBox should be installed. 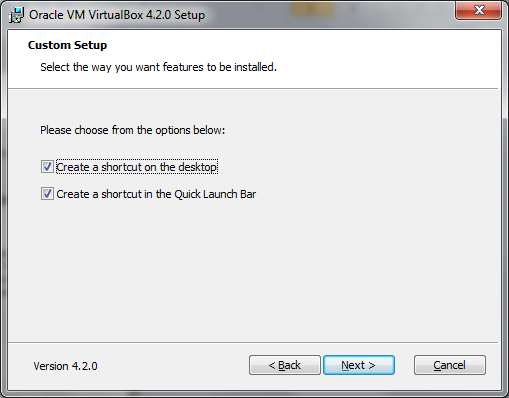 To run it either click the quick launch icon, double click the icon on the desktop or click the start button and type virtualbox into the search box. A screen similar to the one on the right appears. There is a menu at the top and under that a bar with icons. 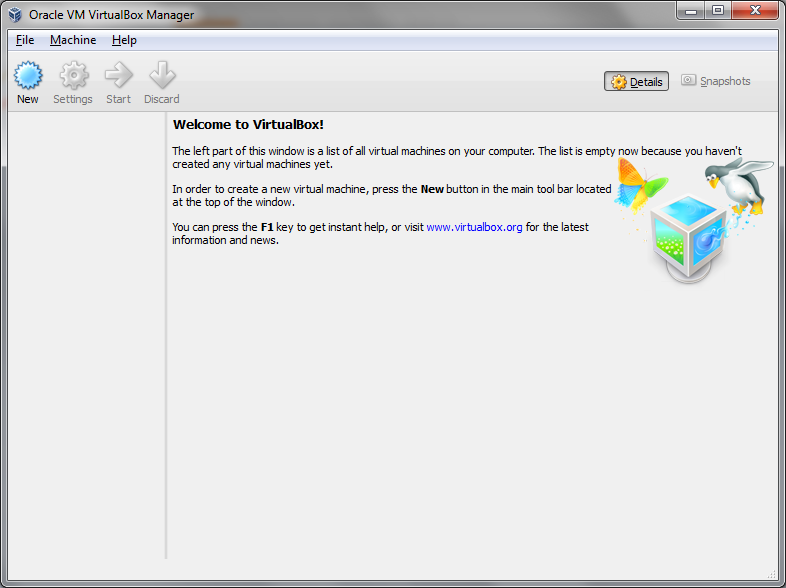 The left pane shows a list of virtual machines (Of which there should be none as you won’t have installed any yet). 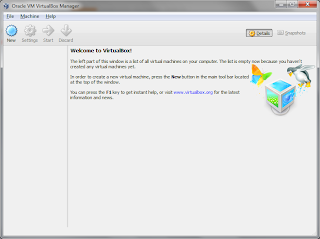 The right pane gives details about selected virtual machines. To install Ubuntu click the New icon on the toolbar. The screen to the right appears. 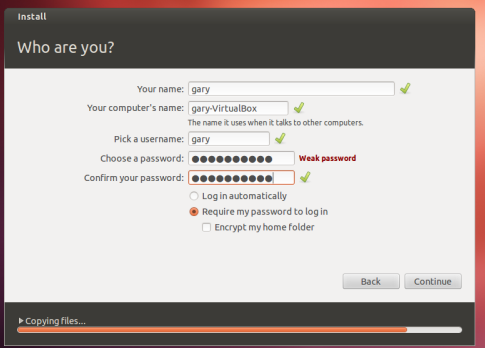 Type the name Ubuntu into the name box. This automatically sets the type to Linux and version to Ubuntu. If you were installing other versions of Linux you would obviously choose a different version. Do not worry if the particular distro you want to use does not appear, just pick the version that is closest. All this does really is predict the memory usage and disk space required on subsequent screens. 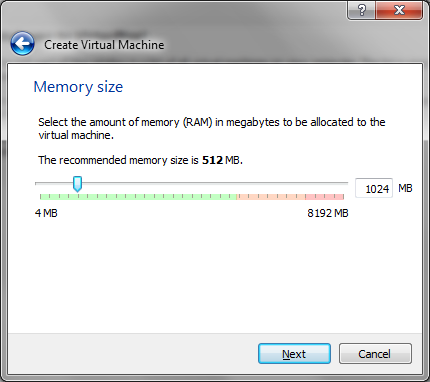 Click Next and you will be asked to choose how much memory to allocate to the virtual machine. 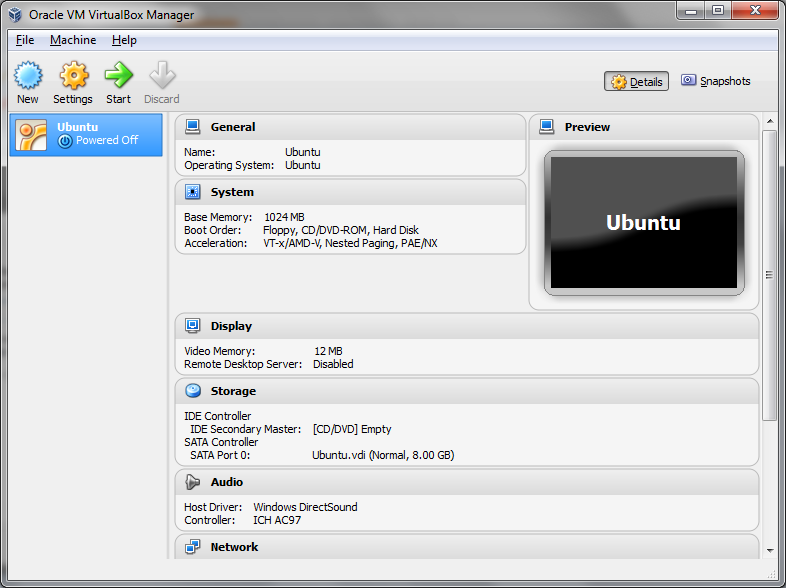 Based on the selection of Ubuntu on the previous screen Virtual Box has suggested using 512mb of ram. In reality I would at least double that if at all possible. 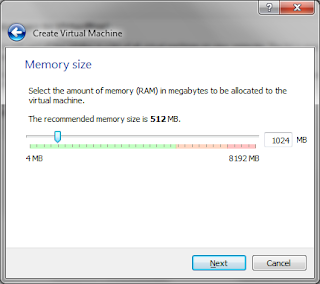 Remember not to allocate all your memory to the virtual machine as your computer will need memory for running other applications and services. 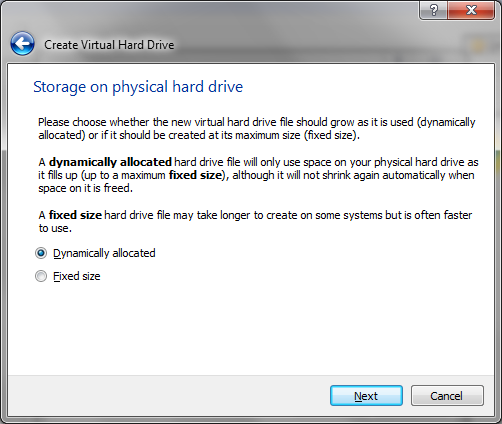 The next few screens deal with allocating space for your operating system by creating a virtual hard drive. 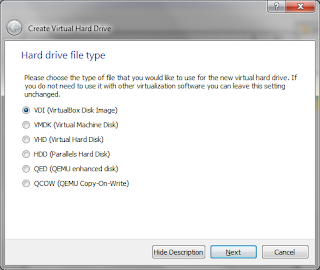 Select create a virtual hard drive and click create. The next screen asks you to decide on the file type for your hard drive. Generally I accept the default option and I won’t pretend that I have even read up on the other options because I haven’t. The default option has always served me well. The third screen is all about how space is allocated to the virtual machine. You can either allocate a fixed amount or dynamically add space when it is required. If you dynamically add space then you optimally only use space as you require it whereas setting a fixed size takes a chunk of space and preallocates it. 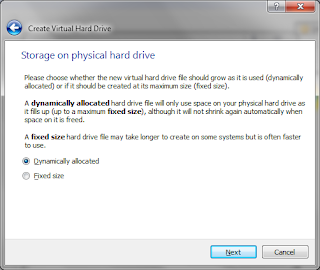 If you dynamically add space then every time you install software within Ubuntu it will take longer to install because space has to be first allocated to the virtual hard drive and then the installation can take place. If you choose a fixed size then because the space is pre-allocated you will only have to wait for the time for the application to install. If you have a large enough hard drive I would recommend choosing a fixed size and make it big enough to store an operating system and other files. The final part of creating the virtual machine is to determine how much space to allocate to it. 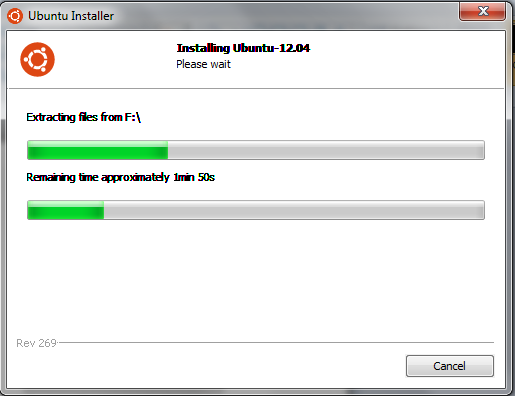 The installer will have made a guess at the minimum space required to install Ubuntu. If you can I would recommend increasing the space as 8gb isn’t all that much. Again be careful not to allocate all your remaining disk space. When the machine is created you will see the machine name in the left pane and on the right the details of the hardware settings for the operating system. If you are going to install Ubuntu from a CD drive insert the CD now. 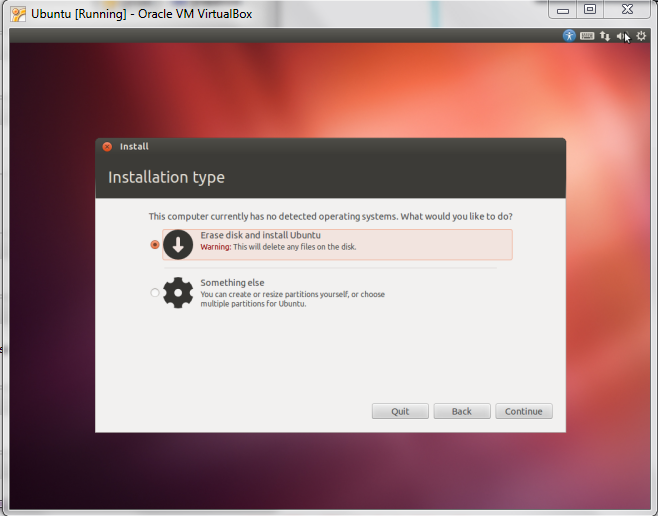 If you are going to install Ubuntu from an image (ISO) then simply start the virtual machine by double clicking on it. 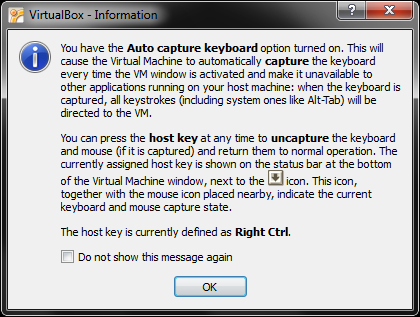 A warning message appears almost instantly stating that keyboard commands will be automatically captured by the virtual machine. I would click the “Do not show this message again” checkbox and click ok. The next screen lets you determine where the image is for installing the operating system. If you are using a CD or DVD select the drive from the drop down list. If you are installing from an image click the folder icon and find the ISO file to install. The virtual machine will now start booting the install media and with Ubuntu you will see a screen asking you whether you want to try Ubuntu or install it. If you just wanted to try the live media then you probably shouldn’t have followed this article at this stage as you can just burn the ISO to a CD or USB drive and reboot your computer to use Ubuntu in live mode. Click on install Ubuntu to continue. The next screen may look scary to someone uninitiated with virtual machines because it says that no operating system has been found and the options are to format the disk and install Ubuntu or do something else. Do not worry, your Windows is safe. 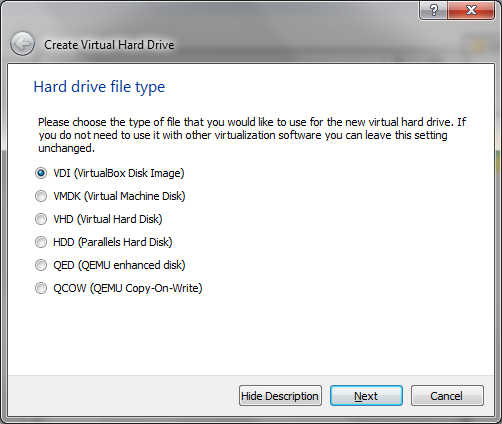 Remember this is a virtual machine with a virtual hard disk. The virtual hard disk has nothing on it. Simply leave the default option to install Ubuntu to use the entire disk. 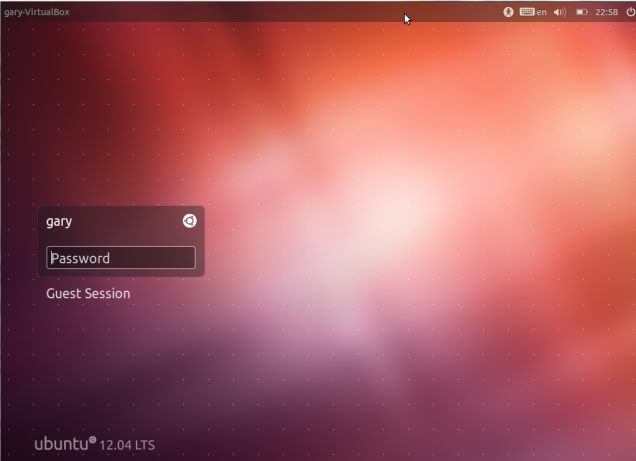 Ubuntu will now start copying files to the virtual drive. Whilst this is going on you can fill in the installation options such as picking your location and the username and password to be used within Ubuntu. 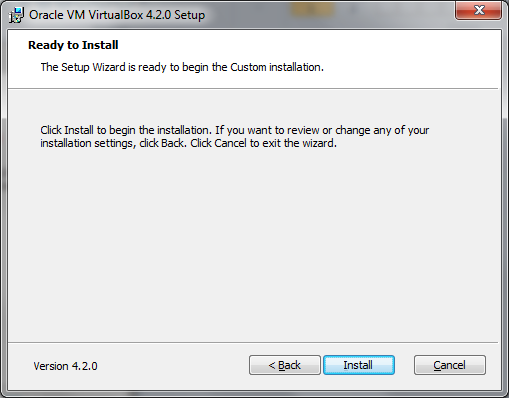 When the install finishes you can reboot the virtual machine and you will be presented with the screen on the right. 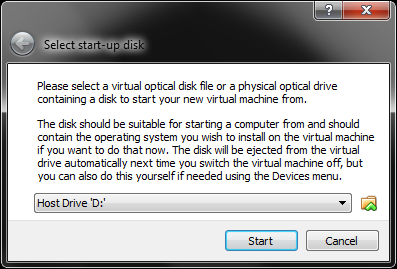 That is it you have a virtual machine installed. So WUBI or Virtual Box? WUBI is great if you plan to try Ubuntu out over a period of time and gradually ween yourself off Windows. You can try it for a period of time and if you don’t like it simply uninstall it. When you boot your PC you can choose to boot into Ubuntu or Windows and so when you choose Ubuntu you are actually using Ubuntu on your computer as it would be if you chose to do a full install. The downside is that it really only works for Ubuntu. If you plan to try out a few versions of Linux then Virtual Box is a much better proposition. 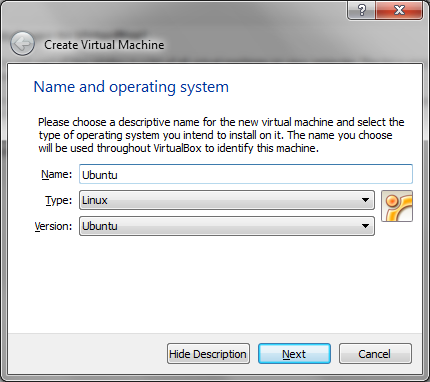 You can choose to create a number of virtual machines each running different versions of Linux. 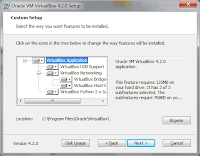 Virtual Box makes it possible to make a more informed choice over which Linux distribution would work best for you. You could of course use live versions of distributions but these don’t really give you the full picture of how the operating system would work when installed fully. Virtual Box for me is the next step after using the live media. The live media is the sales brochure, the virtual machine is a fully working prototype, the full install is the end solution. Is it safe to trust in the cloud? The big difference is whether you want to re-boot to use it. 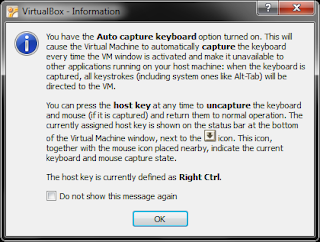 WUBI while it is installed in Windows must be re-booted to use. VB allows you to stay in Windows. 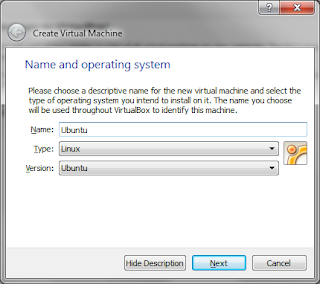 Of course if you just want to use Ubuntu and you use virtual box you have to wait for Windows to load before you can use the Ubuntu virtual machine whereas with WUBI you can just boot straight into Ubuntu which will of course be quicker.